In this tip, I'm going to address why we should drink water. You know, water, "like in the toilet." This line, borrowed from the film Idiocracy, isn't so far from the way many people think about drinking plain water. In the comedy, the world's drinking water is replaced by Brawndo, a Gatorade-like electrolyte drink. We will deconstruct Gatorade at a later date, but today, I want you to understand why this is not an option. You can hydrate yourself with other liquids, but every time you do, you're chipping away at the chances of following a nutritional diet. It's likely that the only reason you think you need to drink water is to stay "hydrated," but you might not truly understand what this means. Let's delve into the meaning behind hydration and just why you need to drink so much plain, "boring" water. 1.Your body is made up primarily of water. 2. You don't need to drink 65 percent of your weight in water each day. This is because, one, if you lost all the water in your body, you'd be dead, and two, that water makes up most of all the living things on our planet. Since we eat living—or recently alive—things, we get some water from the things we eat. When we cook things, they lose their water. This means that the more raw whole foods you eat, the less water you need to drink. Fruits and veggies lead the group of water-rich foods and contain around 95 percent water. If you eat a lot of plants, you can drink less water. But if you don't . . .
3. There is more to hydration than just your water levels. Chemicals in your body react with water so that you can function. We lose water in the form of sweat, and sweat is made up of water and body "salts," which are mainly sodium, chloride, and potassium, but they also include magnesium, calcium, and so on. These are called electrolytes and, basically, are the reason that salt is such a vital component in your diet. Salt is a mixture of sodium and chloride, but generally, we use the term "salts" in reference to electrolytes. Too much salt is bad and too little is bad. Both can kill you. This is why, like water, the amount you consume should be directly related to the workload your body is put under. More P90X® or ChaLEAN Extreme® equals more sweat, meaning that you need more water and more salt. 4. What about water weight? 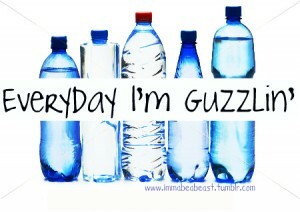 Some people are afraid to drink a lot of water because they're afraid of gaining "water weight." This is the opposite of what you should do. Water weight is a term for your body holding on to excess water because it's not getting enough. The best way to get rid of water weight is to drink more water. It works two ways. If you don't drink enough water or if you eat too much salt in your diet, your body hoards water. This water/salt relationship is referred to as your electrolyte balance. Generally, there's an easy way to tell if you need more water or salt; because most people drink too little water and eat far too much salt—especially those who eat in restaurants. So when you aren't exercising, you almost never need more salt. When you are exercising, getting enough salt becomes an issue. Endurance athletes are ever aware of the need to have enough salt to avoid a condition called hyponatremia, a condition that results when you've had too much water and not enough salt, basically just dehydration from a different angle. Those who don't exercise outdoors excessively almost never have to worry about this condition. 5. So what does water do for you? You'll often hear claims that water helps chemical reactions, regulates your body temperature, and lubricates your joints, eyes, and spinal cord. Sure, it does all of this stuff. In fact, since you're mostly made up of water, a case can be made that it does almost everything. So why split hairs? Your body doesn't work, at all, without being fed a lot of water. You can live days, weeks, and, sometimes, even months without food. But you can't live even a few days without water. 6.Itchy skin. Dry skin. Constipation. Sneezing. Dry cough, headaches, nosebleeds, and acne. These are common ailments related to drinking too little water. Since water regulates your body's functions, it makes sense that minor glitches in bodily functions may be related to not drinking enough water. And this is just a partial list of common ailments. Many symptoms blamed on allergies are probably due to living in a dehydrated state. When you are properly hydrated, your body can better defend itself. 7. The above symptoms may be worse in the winter. Water is required just to breathe, and you lose water through your mouth and lungs. During winter, when the air is dry, more water is required. Add forced heat in the air—like from home heating systems and fires—and the situation is exacerbated. This means that you need to drink extra water in the winter when it's cold, even though you are probably less thirsty. 8. Water and your immune system. During winter, lack of water will dry out the mucous membranes of your lungs, gut, and sinus passages and lessen your resistance to disease. These barriers protect your body against bacteria, viruses, and pollutants when you're fully hydrated and intact. Allowing them to dry out could be the leading cause of the common cold and allergic symptoms, not to mention things like constipation, sinusitis, irritable bowel syndrome, and long-term diseases like hemorrhoids and colon cancer. 9. Water and fat loss. We haven't yet discussed the importance of fat mobilization for energy and its relation to weight loss and effective exercise because, well, that sounds complicated. Anyway, water is the main component of this action. A well-hydrated body has higher levels of oxygen in the bloodstream, translating into an increased ability to burn fat as fuel. The more efficiently you burn fat as fuel, the more effectively you exercise, leading to a better overall body composition. It's said you need about 8 glasses of water a day. However, this will vary due to your activity level and environmental conditions. As a general rule, add a couple of glasses during the hot days of summer and the dry, cold nights of winter. During exercise, you may lose a quart an hour or more. While all liquids provide water, sugar, diuretics (caffeine, etc. ), and carbonation reduce the hydration effect. Combining all three, as in soda, can reduce the hydration efficiency of the liquid to almost nil.